To be honest I don’t like to bring the day job online, but since so many of you were kindly asking, I thought I’d let you know how my first week at my new job was. 3. I have worked out the optimum way to get over to Sainsbury’s (and Ikea, though I have thus far resisted) in the car, and to the main shopping centre on foot. 6. Finally, I learned that I can’t expense it if I make my own laptop bag (and that my boss didn’t realise one *could* make a laptop bag). Darn. Loved this little insight into your working week! Always gives me a happy smug feeling to find a way round traffic that other people haven't spotted….sometimes can be so simple too. Think your boss needs educating re what office essentials can be made. I can tell you we had some mighty good fun with valentines cards at work this week! Glad it's been a good'n, and I think you should educate the new boss in laptop carrying options! I love your first week roundup. Thanks for letting us know how it goes. Is that the main shopping center? It's so pretty! Oooh, what kinds of arguments happen over the milk? I drink green tea, so no milk required. Is that a picture of your old work's fridge? Cause it looks pretty full to me! Sounds like you are settling in well, and knew you would find a way round the traffic crap. Yay for the new job! I gave up drinking milk in my tea when I started at my job. Good on you for figuring the sneaky common sense way to get there. As for the laptop cover could you buy one from yourself? No doubt they'll all want one when they see yours. I love that your boss didn't know you 'could' make a laptop case! Glad the first week sounds good and that you're getting settled! Wooo! Sounds like a pretty good first week to me. I like that you worked out an alternate way to get to work already, good thinking! Maybe if you made your boss a really cool lap top case you would be able to expense both that one and one for you? I love the traffic solution. Glad you are settling in. Can I be jealous that you work in Scotland? It is my dream to live and work there one day. Glad you survived! I've never worked in a place where you have to take your own milk but then I've never worked in an office! I haven't changed jobs in a gazillion years – OK, maybe 22 or 23…but I know that it can be exhausting, but you sound as if you've got it all under control. Glad that it went well! Sounds like you're settling in nicely. I just can't wrap my mind around the fact there are people who don't drink tea or coffee. I would be dehydrated without them. 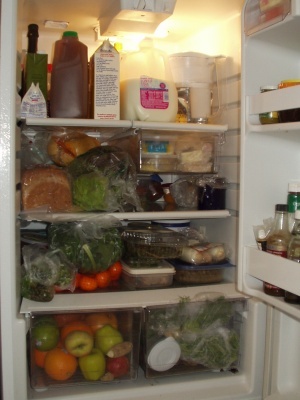 So…does everyone think you're nuts for taking a photo of the inside of the work fridge? Sounds like you're settling in beautifully. Make that laptop bag – then claim it on tax at the end of the year. I just handed my notice in at work today so this time next month I will be up against the same challenges! I just love your sense of humor and wish you were one of my co-workers! 🙂 Stay away from the milk wars!